KUALA LUMPUR: A RECENT collision involving a Malaysian government vessel, MV Polaris and a Greek-registered bulk carrier, Piraeus has sparked another episode of endless claims between Malaysia and Singapore over disputed waters in the Straits of Johor. Singapore argued that the collision took place in its waters but this claim was rebuked by the Marine Department of Malaysia, reiterating that it happened within Malaysian territorial sea in the Strait of Johor. A couple of weeks ago, Malaysia was alarmed when Singapore contended that the extension of Johor Port Limits has encroached into its maritime areas. This ongoing issue requires a solution – time to finally erect proper ‘maritime fence’ between these two neighbouring nations. Singapore was once part of the Sultanate of Johor established in 1528, a legacy of the Malacca Sultanate that fell into the hands of the Portuguese in 1511. In 1819, the British established a trading post in Singapore with the permission of Johor rulers at that time, Temmengong Abdu’r Rahman and Sultan Hussein Shah. 5 years later, Singapore was ceded to the British together with the surrounding islands in the Johor Strait and the Singapore Strait. A century later, the British government signed a treaty with the Sultan of Johor in 1927 to divide the Strait of Johor and this was reiterated in the 1995 Treaty between Malaysia and Singapore – the boundary is formed by straight lines running along or near the deepest channel of the Strait of Johor. This explains why the political boundary line between Malaysia and Singapore is drawn in the middle of the Strait of Johor with all islands in the Strait, namely Pulau Ubin and Pulau Tekong belonging to Singapore. Nevertheless, prior to the 1995 agreement, Malaysia has issued ‘Peta Baru’ or new map in 1979 where Malaysia unilaterally included Batu Puteh and Tuas Port as part of the Malaysian maritime territory. Singapore protested to the said claims. As shown in Map 1, this has resulted in the exclusion of Tuas Port area in 1995 Agreement. The Brown line in Map 1 displays Malaysia’s maritime claim in 1979, an area that has been swallowed up by Singapore through reclamation works in and around Tuas Port beginning 1996. A State may acquire sovereignty over a certain territory if the sovereignty is transferred or ceded by the sovereign to another. This was the method used by the British when they acquired Singapore in 1824. In addition, under international law, prescription refers to acquisition of sovereignty by way of actual exercise of sovereignty, maintained for a reasonable period of time and is effected without objection from any states. 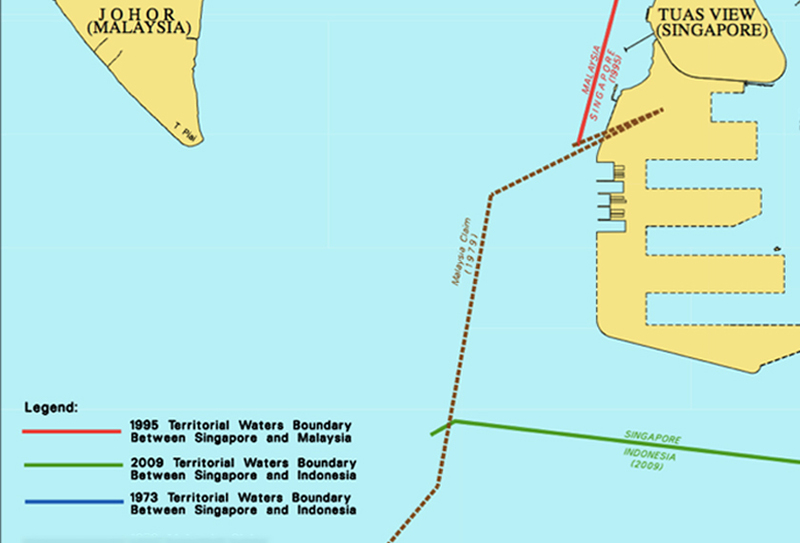 For instance, as depicted in Map 1, Singapore has actually underwent major reclamation works in the most-eastern extent of Malaysia’s unilateral claim (signified by the brown line), turning what once a disputed maritime area into part of Singaporean territory. If Malaysia keeps quiet and allow Singapore or other nations for that matter, to exercise sovereignty in disputed areas, sooner or later, Malaysia might not be able to claim sovereignty over it anymore based on the concept of prescription under international law. By virtue of this fact, Malaysia must be steadfast in denying any claims that may undermine its sovereignty in disputed areas and consider erecting ‘maritime fence’ to put an end to unwarranted territorial encroachment. These ongoing disputes are manifestations that if proper maritime boundaries are not drawn, Malaysia and Singapore are free to claim those areas as theirs. 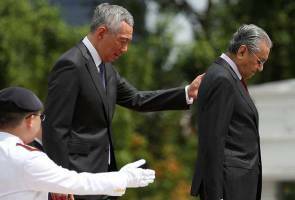 It is now timely for both Malaysia and Singapore to start focusing on resolving these disputes by properly delimit their maritime boundary lines in disputed areas. Till today, Israel and Palestine are still in conflict with each other as there are lack of proper boundary delimitations between the two entities in the West Bank. As a result, both fail to co-exist peacefully and still at war till today. As key players of ASEAN, it is important for these two nations to maintain friendly relations and to consider resolving maritime disputes between them amicably – good fences make good neighbours. * Mohd Hazmi Mohd Rusli (Ph. D) is a senior lecturer at the Faculty of Syariah and Law, Universiti Sains Islam Malaysia and a visiting professor at School of Law, Far Eastern Federal University, Vladivostok, Russia. ** The views and opinions expressed in this article are those of the author(s) and do not necessarily reflect the position of Astro AWANI.